Decent response & performance all round. Load impact performed average. Downtimes aren't a concern. Servers are stable enough to run a small business site. Support average we did not have a poor experience but service could be better. Very affordable to get started, renewals are a bit more pricey but within the industry standard. Starting in 1999, Dynamic Hosting is a Canadian web hosting provider that emphasizes managed WordPress, server, and cloud hosting services. Their culture and business philosophy revolves around bringing the best hosting experience to their clientele, not just a inexpensive hosting solution. Canadian Company - Dynamic Hosting utilizes a 100% Canadian based infrastructure and an English/French speaking 24/7/365 support team. Emphasis on Developer Support - Their product line up and add-on features are geared towards Developer convenience so their clients can focus on developing their sites. Green-minded - Starting in 2004, Dynamic Hosting has implemented green conscious practices for their hosting products and proudly display their use of renewable wind-generated electricity. Managed Hosting Options - With features like automated malware scanning, BitNinja antivirus, and system and security updates, Dynamic Hosting emphasizes the use of managed services for their products. Cloud Utility Products - We are happy to see cloud-based utility products like cloud storage, file sharing, and dedicated email services. Over the years we have helped hundreds of people and small business build, support and maintain their websites. In most cases our customers trust us to select the where they should host their website this is why we are constantly evaluating the best web hosting company for Canada. In our Dynamic Hosting review, we have found that Dynamics key features and benefits are in their community driven, fully Canadian business approach and the number of managed services across the breadth of their product line from shared to dedicated cloud hosting. 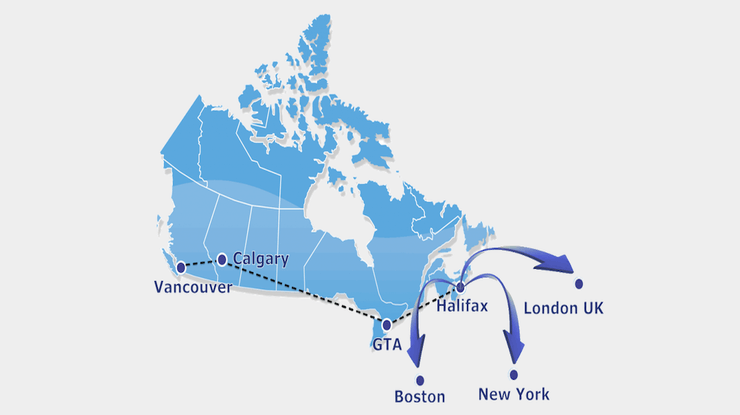 Dynamic Hosting supports product deployment options in three data center locations; Vancouver, Calgary, and Halifax. Their network infrastructure is low latency and utilizes an optimized routing configuration that minimizes the number of hops between key locations. With a 100% Canadian support team, Dynamic Hosting provides stellar support services through their 24/7/365 ticket, phone, and live chat system. In addition to 24/7 technical support requests, their sales team can be reached over the phone at any time for assistance during a purchasing decision. Another stand out feature of Dynamic Hosting is the number of managed service offerings dispersed within their product line. They offer a managed WordPress hosting in their Shared product line, two managed cloud options and a product addon with a tiered system for managing VPS/VM product orders. What makes this so useful is that they provide a robust amount of options for clientele that perhaps lack system administration experience. These options can save clients a lot of money by purchasing a managed server plan or a managed product instead of paying a premium for a dedicated server/platform administrator. This Canadian Web Host provides a number of different web hosting products and services to bring a better web hosting experience to their clientele. They offer the standard hosting packages we have come to see from hosting market like shared and VPS packages. In addition to those, Dynamic also offers a few different cloud services that help them stand apart from the crowd. 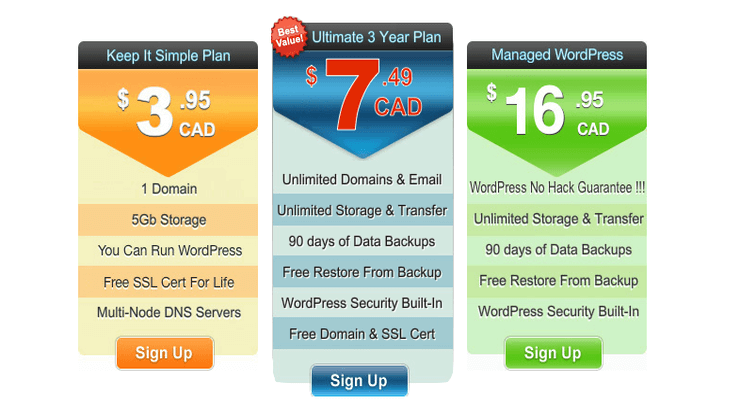 Listed at $3.95CAD the Keep It Simple package offers a basic, entry-level tier to their Shared Hosting line up. One thing that we discovered about their displayed pricing is that they advertised the adjusted cost of the product if purchase for 36 months in advance. Though a bit more expensive than the Keep It Simple package, The Unlimited or Ultimate 3year plan offers much more utility for a client that needs more than just a single site or needs to host a site that needs more than 5GB of storage. Dynamic’s Managed WordPress hosting option is a premier hosting plan that offers a number of advantages over hosting a WordPress instance in a Keep It Simple or Unlimited plan. 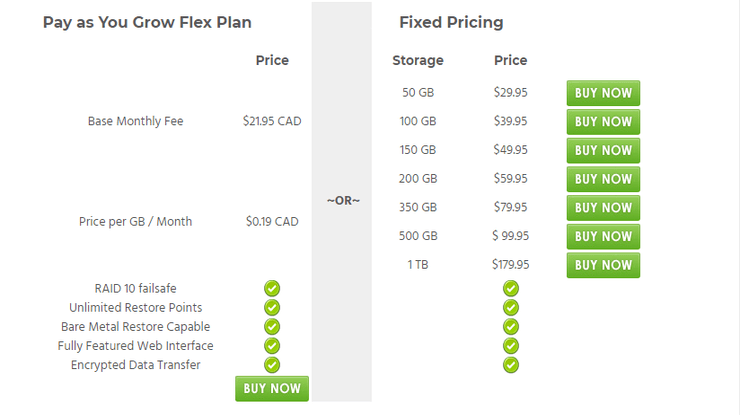 When selecting a month to month or 3-month billing cycle, there is a $59.95CAD Setup fee for the product. The setup fee includes a site migration, which they normal charge $50CAD for 1 site, and CloudFlare Pro service configuration. 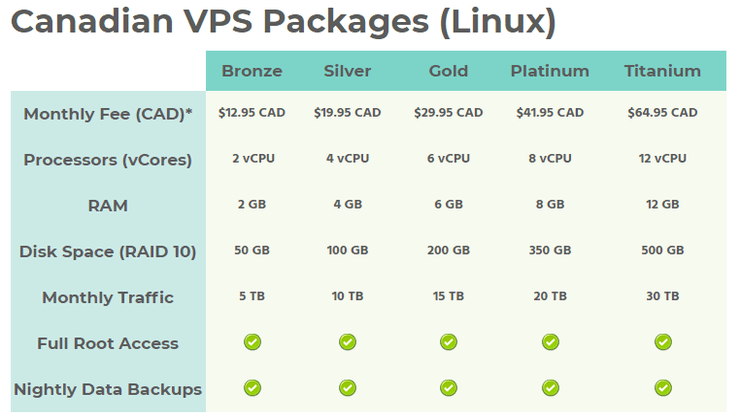 Dynamic offers five tiers of VPS hosting plans starting with the Bronze plan at $12.95CAD. These are Linux only packages that can have various CentOS, Ubuntu, and Debian OS server installs. You can choose to have a Windows-based solution but you will need to purchase a Windows OS license either from Dynamic or have your own. Pairing a VPS product with their Managed Server product add-on can significantly enhance your hosting experience and give you an unparallel peace of mind that your server environment is in good hands. Virtual Machine Hosting as Dynamic calls it is very similar to VPS hosting with one major difference. The VM hosting data storage method utilizes a SAN (Storage Area Network) storage method which provides a greater level of reliability and stability for the individual VMs in the VM host. The best way to determine if you need a VPS or a VM from Dynamic Hosting is to identify your maximum down allowance for your business. If higher levels of availability are required upgrading to a VM product would be the better way to go. The Dynamic Hosting Manage Cloud product line is a highly scalable, flexible hosting option that is fully supported by their Canadian-based support team. A Managed Cloud product comes with nightly backups, weekly off-site disaster recovery replication, security patching, and on-demand resource allocation and modification. The Managed Cloud Hosting products come in 3 tiers. 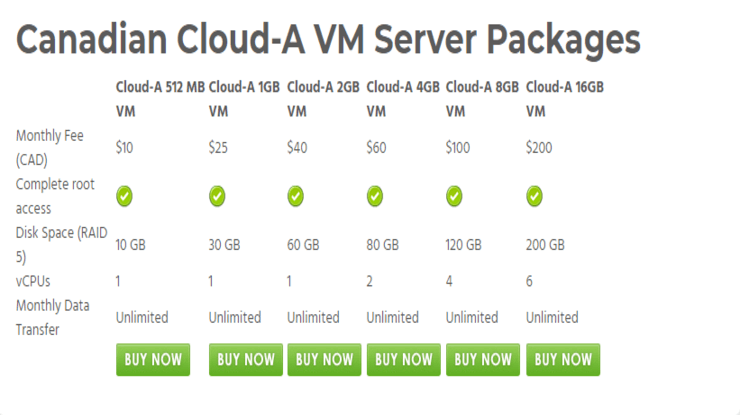 The starter tier of Managed Cloud line-up is priced at $39.95CAD. This option provides a solid, cost-effective product for entry-level cloud computing needs. This is the middle tier Managed Cloud product at $89.95CAD, that increases the available resources and security patching frequency from monthly to every two weeks. The highest tier of Managed Cloud product at $219.95CAD, brings the full gambit of resource allocation, a significant jump from the Cumulus option, and increases the patch availability to weekly to keep your environment safe and secure. We found this product from Dynamic to be a rather interesting offer. In a partnership with CloudA, Dynamic offers the CloudA service option to their clients for a true cloud IaaS (infrastructure as a service) option to support API and SDN centric solutions. Dynamic Hosting also provides access to utility cloud services that can enhance your web solution experience and save you some time and money along the way. The Dedicated Cloud Email Solutions provided by this Web Hosting provider, offer a large amount of disk space while keeping costs down on a per-user basis. 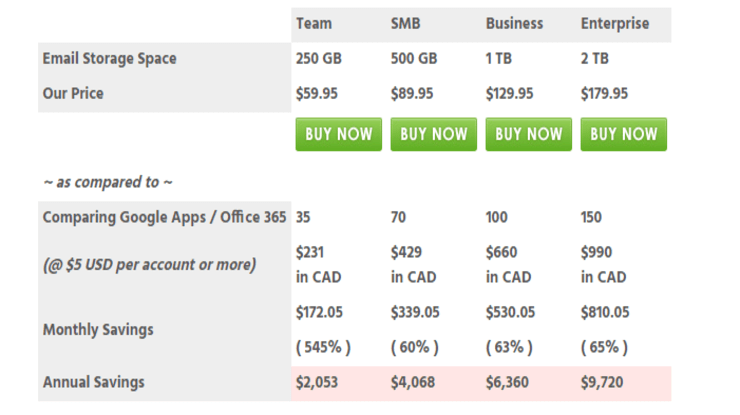 In the image below you can see the cost difference when utilizing a service that charges per user. A dedicated cloud email solution can save you quite a bit. The Cloud Storage product from Dynamic comes in two different plans Pay-as-go or Fixed Price. This product has huge appeal for a self-managed off-site disaster recovery setup and can help maintain peace of mind while keeping your web solution costs down. In this web hosting review, we have found that Dynamic’s support focus and Managed Product line up provide clients with peace mind and greatly enhance their web hosting experience. Their staff is available 24/7/365 for technical support and sales related customer service. We also really enjoyed seeing Dynamic’s product line pioneering cloud utilization and providing managed support for the cloud initiatives which breaks down and de-mystifies the complexity of cloud solution. We would have liked to see an easier to use website when simulating a purchasing decision. We found that the product descriptions could be sparse, providing little to no information. In some cases, vital information was found in other places like their knowledge base or blog. Having access to that same information when looking at the product description could answer a few client questions beforehand and save them time during that decision making process. We recommend taking your time with site layout and get comfortable with the product offerings to best determine what your web solution needs are. Additionally, you can always reach out to their staff to get more information or assistance with making the right product purchase. In summation, Dynamic Hosting is an excellent choice as a managed WordPress host but their are better solutions if you are looking for shared web hosting. While their prices aren’t the cheapest, the level of service from their technical support team and their focus on developer-friendly product offerings can justify the extra monthly expense.